Remember when taking a picture was a special thing in your family. My parents’ photograph albums are filled with snapshots from birthdays, graduations, first communions, and other special events. In our house, a camera was a very common accessory on many occasions. 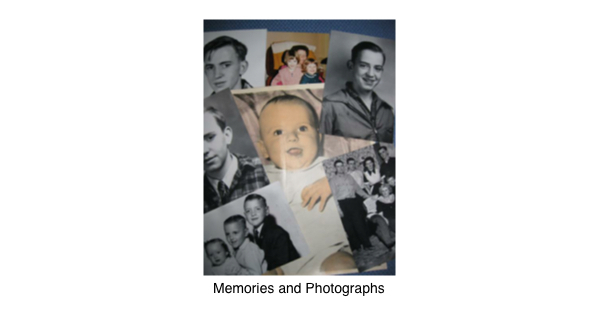 My family’s photograph albums are also filled with many pictures of things that are not tied to a special event. There are shots from a heavy snowfall, kids playing croquet in the backyard, or family members chowing down at a picnic. Today with digital photography and web services such as Facebook and Instagram, I feel as though the special aspect of taking pictures has lost something. I remember having to wait a week from the time we sent a roll of film in by mail for processing to when the pictures were returned by mail. Today, you can post an image on-line within seconds of taking the picture. I guess that’s why I got a little nostalgic this week when an envelope containing old photographs arrived at my mail box. My sister found the pictures while helping my dad clean out his attic. I cherish this gift of old photos. I’m not only grateful to my sister for sending them to me. I’m also appreciative that someone took the time many years ago to make sure special moments were documented on film. The package contains some prints that are quite familiar. There’s a shot of my dad’s family: Dad, his two brothers, his sister, and his mom and dad. I remember the original hanging on the wall in my grand-parents’ home during the years I was growing up. It was taken in the family parlor at the home where Dad was raised. There are a few pictures of my dad from his high school years. I had not seen any of these. In one shot, he’s smiling broadly. In another, he had a quite serious look on his face. There is a baby picture of me at about one-year old. I believe it was colorized using some kind of 1950’s technology. I guess I was a happy baby, or at least happy at the time that photograph was shot. There’s a big smile across the face of this future husband, father, and writer of columns and books. Also in the batch is a three-shot featuring my sister, brother, and me. We’re dressed up in our Sunday best for that studio shot. I was probably four years old. I have no real memory of the time it was taken. There’s a shot of my mother with my two daughters taken in the mid-1980s. I took that picture and sent a copy of it to my family at the time I had the film processed. My mom passed away thirteen years ago. Anytime a picture of her shows up, it brings back nice memories as well as an appreciation for her desire to take pictures, maintain photo albums, and capture those special times in all our lives. According to my sister, these photos were kept in a box belonging to my grandmother. When my grandmother passed away nearly twenty years ago, my mom got the box of photographs. She probably put them away in the attic where they remained until my sister found them. The pictures were well travelled, yet they didn’t leave my dad’s house for the past two decades. Now, some of those treasured memories belong to me. I’ll keep them for as long as I can. Hopefully, they will pass on to the next generation. By that time, who knows what Facebook or Instagram will do to our traditions of taking and storing photographs. All I can hope for is that future generations of my family will have as great an appreciation as I have had for these slices of life, preserved through the magic of photography.